Over three decades ago, before crafting their first vintage, the Duckhorns and their winemaker had a passionate discussion at the kitchen table. Though they debated making a cuvée, they chose to focus on varietal wines. Even so, Duckhorn Vineyards has always remained fascinated by the artful blend of varietals from diverse Napa Valley vineyards. 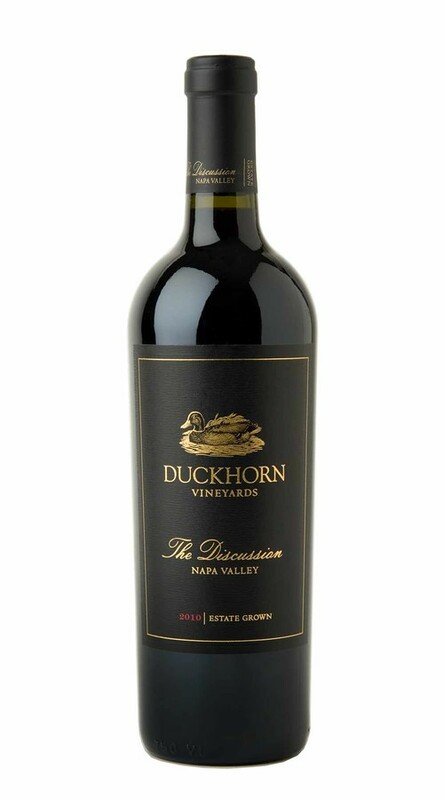 Embodying the depth and complexity of a world-class Estate program, The Discussion represents the pinnacle of the Duckhorn Vineyards portfolio and the ongoing dialogue that defines great winemaking. The Discussion was blended using the very best barrels of wine from the finest blocks of our estate vineyards. While this wine is abundantly rich and flavorful, it is defined by its refinement and complexity. Aromas of licorice, graphite, blackberry, violet and French thyme offer a beautiful prelude to an opulent mouthfeel marked by pure, focused flavors of Bing cherry and spiced plum, as well as silky tannins. These tannins, and seamlessly integrated oak, provide lovely structure, adding depth and nuance to this age-worthy wine. Due to a wet spring and mild growing season the 2010 harvest started two weeks later than we would normally expect. Later, milder seasons tend to result in wines of fine elegance and balanced natural acidity. This is exactly what we see in our white wines and the best reds from superior locations. During harvest the conditions (a strong heat wave and then significant late rains), caused us to be very diligent in the vineyards fine tuning the fruit and making timely picking decisions. In the winery we took precautions to be respectful to the characteristics of the fruit and feel that has resulted in wines of character and intrigue. Absolutely EXCELLENT, smooth bottle of wine!